An essential tool of any writer's toolbox is vocabulary, this goes hand in hand with punctuation and grammar. 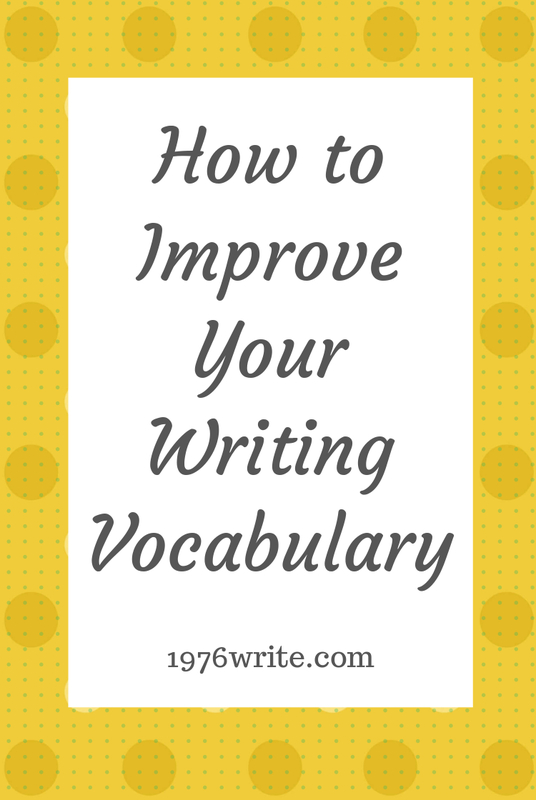 Having a greater vocabulary will make your writing more compelling, and help your readers know what you mean. Writing vaguely will soon become a thing of the past, and will leave you with an tool you'll never be without. When you discover a new word try putting it in your journal, an email or slip it into a conversation. Better still write it down, and make a list of the new words you learn each week. After you've left school, or university, reading becomes a relic of the past. Don't abandon reading completely, read anything you can get your hands on: newspapers, magazines, books, internet articles. Words in the English language come from a familiar root, prefix or suffix, generally taken from Greek or Latin. You'll have a greater understanding of words when you discover what the root is. If you're using the same words over and over, try conveying the same meaning with a different word. A great habit to keep and a simple way of finding new words. You'll be able to express yourself more easily. This point is pretty similar to number's 1 and 3, learn a new word every day. Use your thesaurus or dictionary, and start writing down the new words you've uncovered. If you're not sure what a word means write it down, if not make a list, and look them all up later. Journaling not only helps your writing style but also helps you to improve your vocabulary. If you love reading, you may stick to the same kind of reading material. Try diversifying, and branching out on the topics you read, include politics, contemporary literature, and maybe even a bit of Shakespeare. This kind of word game will challenge your brain, and exercise it at the same time. Word puzzles make you think harder of words you don't usually use in everyday life. A new word will become part of your vocabulary after about 10 or 20 repetitions. In order to make it stick you need to write down the definition, and the sentence you're using it in. Say a word out loud, something like minuscule, which means tiny or very small. Speak out loud a sequence like, grand, large, medium, small, tiny, very small, and minuscule. Try listing the things you think are minuscule. A mnemonic is a memory trick, to help you remember new words. Try sounding out and word, then put it in a funny sentence. Start your own list of new words, and make it a daily habit, include them in conversation and writing. Draw up a quiz at the end of each week to really bond them to your memory. If you're in the habit of using the same words over and over again, grab your thesaurus, pad and pen. Start listing new words to use instead. The internet is full of writing courses, or courses you can attend locally. Find a course that is full of quizzes and assignments to develop your fluency, and help you read up on your writing skills. If you don't have the luxury of an editor you're probably doing this already. By being your own editor you have the controls in proofreading and editing your work the way you want it sound. Getting rid of overused words, and replacing them with something more decisive. Improving your writing tone, style and giving your work clarity. Your vocabulary work's from a larger group of words that you have an idea of. This small group of words helps you to express yourself and your ideas. Discovering new words and changing from your passive vocabulary to an active, expressive vocabulary, isn't as hard as it sounds. All you need to know is how to define, pronounce and spell those words. You can do this by saying them out loud and using them at every given opportunity into your active set of words. Slip a pocket dictionary and thesaurus into your bag or pocket, and boost your vocabulary. Do this while you're on a train or in a waiting room. Take a few minutes out of your day to learn a new words, and see how much difference it makes to your vocabulary.